The world is fast becoming a global village due to the effect of globalization and rapid growth in technology. This has enabled information sharing among various people of the world, thereby solving basic societal problems and bringing about rapid development. This research work Web Based Student Management Information System documents student’s information and manages student’s data online using appropriate database application. The system was studied and relevant officials were interview to acquire the required data. This designed system allows easily information retrieval of accurate information for effective and efficient allocations. The system is developed using the Html5, CSS and Php programming language, and MySql for database management, under a Windows platform. The research work includes a critical self-reflective commentary on student’s information system. Education is an important and traditional part of the society. As time has progressed, education has also progressed into the modern times. So in accordance with the progress of education, changing the way of maintaining college information is required. Most of the college work is done manually such as class attendance, notes, college dues, etc. These processes take time. If all the work is included on an online system, then it can reduce time and work. 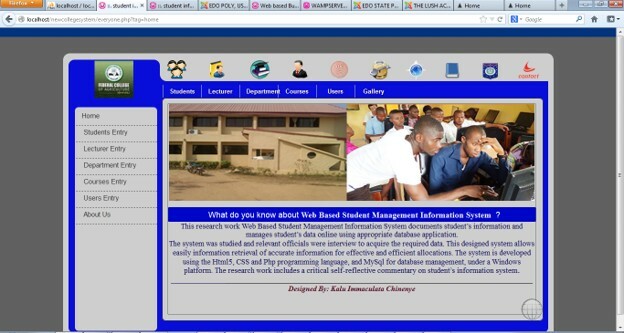 The Student Information System (SIS) is an Intranet based application that can be accessed throughout the institution or a specified college. The system is helpful for both students, lecturers and college authorities. The main principle behind the need of a Student Information System is easy supervision of the college. The system helps to explore all the activities happening inside the college. It can handle the details of students, lecturers, class details, course details and fee details. facilitate easy access to information. For this the users need to be registered with the system after which they can access or modify data as per the permissions given to them. What is a portal? A portal is a gate, a door, or entrance. In the context of the World Wide Web, it is the next logical step in the evolution toward a digital culture. Portals have become one of the most visible information technology (IT) issues in higher education, as well as the commercial sector. The latest Gartner International hype cycle curve places portals at its apex. That firm estimates that at least 70 percent of Nigerian higher education institutions will have partially or fully implemented portals by Fall 2000. By 2018, Gartner predicts that 80 percent of universities with a thousand or more students will have enterprise portals.. The aim of this project is to incorporate a Student Information System automate all the functionalities of a college. The reason for developing a web or software system is to reduce paper work and save time, thereby increasing efficiency and decreasing the work load. The project provides information about the college for both students and lecturers. Information about the college, course time tables, course information, exam time tables, department news, course notes information from lecturers to students and more. The system provides the flexibility of generating the required documents on screen as well as on printer when required. This work critically explores the possible ways of making clear of the mystery behind database and related technologies, web hosting services, protocols and of course design and encourages young programmers to join the race without feeling interims to their counterparts in the development parts of the world. Without shifting this focus to website design, In general, this project aims to enhance efficiency and at the same time maintain information accurateness The study will go a long way to cutting down on time wastage, inefficient use of statistical data, manual errors and duplication of efforts by both staff and academic personnel. It will also enhance efficient query and inquiring, ensure security of records and assist the college in coping with the daily work based. The internet with all its functionality has indeed changed the way people live and interact politically, socially, economically and otherwise the internet as with database combines audio, video and texture contents while eliminating time and space of traditional media. The study provides solutions to practical problems using knowledge gained from the particular class of software engineering, system analysis, system management databases and web design in my undergraduate studies in information technology. The implementation of the management system will help to manage institutional resources in an efficient, effective and accountable manner. This project will also demonstrate that the implementation of the management system will improve the quality of services, creating an automated application to plan and manage the delivery of courses. The management system will provide more ease for managing data rather than manually maintaining documents. Valuable time will be saved and lives will be made easier. This is a generic type of software, suitable for all colleges.Student Information Systemwill work on a college area network. Under this system it will include all the departments under the particular college. It can have billing system for finance department, class attendance, online notes and notice board so that students can get all the information by using their valid registration id and password. Administrator will able to get all the information regarding any college members on any particular day and time. The Admin panel will also able to edit the login display panel of teachers, staff members, students etc. Admin can add person, delete and give special permission. Lecturers can get information of any students under their particular class. Lecturers can also make query by using grade, percentage, can see list of students who comes under the category of attendance shortage and many more under this one roof. For student section, they can get any particular Lecturer’s notes for any particular day and other information regarding the college. Such as an upcoming college lecture in a particular month, group work schedules, assignments, test and exam notifications and many more. Student section will also include learning section, so that students can prepare for their exams. Can get help through the help option to view different features of the system. Students can give feedback on college/staff/any other student. Chapter three is concerned with the system analysis and design. It presents the research methodology used in the development of the system, it analyses the present system to identify the problems and provides information on the advantages and disadvantages of the proposed system. The system design is also presented in this chapter.